Pressure canning is recommended for low-acid foods. Low acid foods are not acidic enough to prevent the growth of bacteria and should be processed at temperatures of 240 degrees to 250 degrees, which is attainable with pressure canners. Low-acid foods include; red meats, seafood, poultry, milk, all fresh vegetables except for most tomatoes. To safely can low-acid foods, you must use a pressure canner. High temperatures are needed to destroy heat-resistant bacteria and their spores that can spoil low-acid foods. Clostridium botulinum is a spore- forming bacterium that can cause botulism, a potentially deadly form of food poisoning. Botulinum spores are on most fresh food surfaces. They only grow in the absence of air, so they are harmless on fresh foods. To destroy bacteria and spores, temperatures higher than the boiling point of water (212 degrees Fahrenheit) are needed. Follow current recommended pressure canning procedures to ensure a safe low-acid product. What Foods Must Be Processed in a Pressure Canner? Pressure canning is recommended for low-acid foods. Low-acid foods are not acidic enough to prevent the growth of bacteria and should be processed at temperatures of 240 degrees to 250 degrees, which is attainable with pressure canners. These foods have a pH value higher than 4.6. Mixtures of low-acid and acidic foods also have pH values above 4.6 unless their recipes include enough lemon juice, citric acid or vinegar to make them acidic. What Are the Steps for Successful Pressure Canning? 1. Put 2 to 3 inches of hot water in the canner. Place filled jars on the rack, using a jar lifter. Fasten the canner lid securely. 2. Leave weight off the vent port or open the petcock. Heat at the highest setting until steam flows from the petcock or vent port. 3. Maintain a high heat setting, exhaust steam 10 minutes and then place a weight on the vent port or close the petcock. The canner will pressurize during the next three to five minutes. 4. Start timing the process when the pressure reading on the dial gauge indicates that the recommended pressure has been reached or when the weighted gauge begins to jiggle/rock. 5. Regulate the heat under the canner to maintain a steady pressure at or slightly above the correct gauge pressure. If the pressure reading goes below the recommended pressure, you must bring the pressure back up and start the timing process over again from the beginning. 6. When the timed processing is completed, turn off the heat, remove the canner from the heat (if you are using an electric range) and let the canner “depressurize” at room temperature. (The dial needle moves back to “0” or no steam sounds when the weight is nudged gently.) Do not force-cool the canner. Releasing pressure from a partially opened vent or placing the canner under cool water will result in underprocessing. It also may cause unsealed jars and loss of liquid from the jars. Quick-cooling also can warp the canner lid of older model canners. 7. 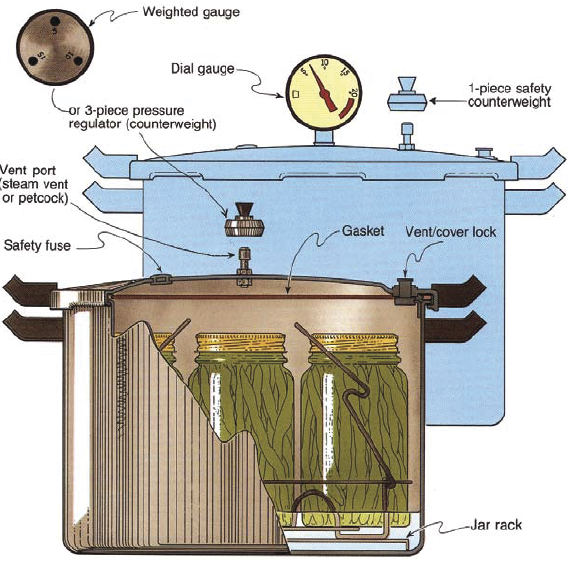 After the canner is depressurized, remove the weight from the vent port or open the petcock. Wait two minutes, unfasten the lid and remove it carefully. Lift the lid away from you so that the steam does not burn your face. 8. Remove the jars with a lifter and place them on a towel or cooling rack, if desired. Do not set the jars on a cold surface or expose them to breezy conditions, which could lead to breaking of the jars. IMPORTANT: If at any time the pressure goes below the recommended amount, bring the canner back to pressure and begin the timing of the process over from the beginning (using the total original process time). This is important for the safety of the food. Always operate your pressure canner according to the manufacturer’s directions. Only use canners that have an Underwriter’s Laboratory (UL) approval. What Are Some Common Errors Using a Pressure Canner? Air trapped in the closed canner during processing. Air trapped in a pressure canner lowers the temperature and this results in underprocessing. To be safe, all pressure canners must be vented for 10 minutes before they are pressurized. Using an inaccurate dial gauge. Gauges should be checked for accuracy each year before the canner is used. If the gauge reads high or low by more than 1 pound at 5, 10 or 15 pounds of pressure, replace it. Weighted gauges are always accurate. If your canner has both a gauge and weight, go by the weight, using the gauge as a guide. How Should a Pressure Canner be Stored?